I had a colleague, Sue Watling, tag me in a tweet for a #Shelfie – I thought I’d step up to the challenge and show my #sheflie with a variety of my much loved books! A #Shelfie is pretty much photos of your shelves – whether it’s full of books or ornaments, or to the bare minimal! For my #Shelfie challenge – I decided to stick to books and share with you (the lovely reader) my favourite books so far – per shelf! My favourite actress of all time is Audrey Hepburn – someone with such grace and style! I love watching her movies, especially on a rainy day with a big cup of tea and wrapped up in blankets. I love this book collection – from finding out her past to pretending I’m Holly Golightly (minus the cat though…). However, my favourite book is What would Audrey Do? by Pamela Keogh. It’s not quite a “how to” guide to be exactly like Audrey Hepburn – but it shows why Audrey was graceful and her thought process behind her actions. Think of it as a motivational book – but focused on an individual rather than just yourself! Ok so this shelf doesn’t really have a theme to it – a mix of Marvel, a picture of my best friends and several books. But there’s two books on this shelf that I’m currently reading which I wanted to share with you. There is a bit of a story behind this book. Back when I ventured on my own to Italy, I had travelled to Rome and had a challenging and bizarre road trip. As I got to the hostel I was staying that, my anxiety had gotten the better of me – however my room was nowhere near ready! So I sat in the communal area, absolutely terrified and wasn’t sure how to strike a conversation up with anyone so grabbed the first book from the shelf and started to read it. More to distract my anxiety – however it wasn’t quite sinking in! However the book ended up being the topic of one of my first conversations and the development of a friendship. You see, S had come in from walking around Rome and needed to cool down, but her room was also not ready. So she flopped on the sofa next to me and after a while, noticed what I was reading and that subsequently broke the ice between us. That night, I started to read it again and this time, took in the story. Throughout each page, you felt for the main character and I couldn’t help but picture the settings around the character. I was hooked! Unfortunately I never got round to finishing the book as I left it in the hostel. Oops! It wasn’t a couple of years ago, when I was talking about books that I remembered The Goldfinch and wanted to know how it finished. So I ordered it off Amazon and have started to read it again – I’m not anywhere near the end so no spoilers! I am also going back to the lifestyle of a student (part time) to study my MA in Education, Inclusion and Special Needs. It has been a while since I’ve done any essay writing (yet always seem to be the one giving study advice to my friends!). So it would make sense to prepare myself back to the academic-sphere right?! This is just one of the many books in the Palgrave series – I would recommend any student to have these. Full of tips and advice on making the most of University life, get your head around referencing and essay writing. They do also have online resources you can access! Majority of these books (apart from two of them) are all novels which just take me away to a different world when I’m reading them – I’m still working my way through these books. However, the book I want to show you does link to one of my first blog posts – The Curious Incident of the Dog in the Night-Time. The book focuses on a young boy who is on the Autistic Spectrum and shows you his thought process, which involves finding out what happened to the neighbour’s dog who has been found dead in the garden. I saw the theatre production a few years ago and then bought the book. When I read the book, the attention to detail in the pages were reflective onstage – and although I knew exactly what was going to happen next, it still kept me gripped! Again – not quite themed (you can see a pattern here!) – and yes, that is Joking Hazard! Hygge is essentially the art of being cosy – bring on the candles and the blankets now that Summer is going and the leaves are falling down. There’s nothing more relaxing than having a soothing environment to bring peace to your mind. I’d love to visit Denmark to see how they live. But in the meantime, you can find me in my PJ’s with my vanilla candles and fireplace warming my living room up! Ok – I’m cheating here. I don’t have shelves in my bedroom. However, this is what I’m currently reading at night. If you think Anna Kendrick is hilarious in the movies, then you will love her book. Books are meant to be relaxing when you’re in bed… however I find myself laughing out loud! Not only is it funny, it also shows a part that not everything in life is perfect. It’s ok to be pissed off every once in a while! Why not show us your #Shelfie?! 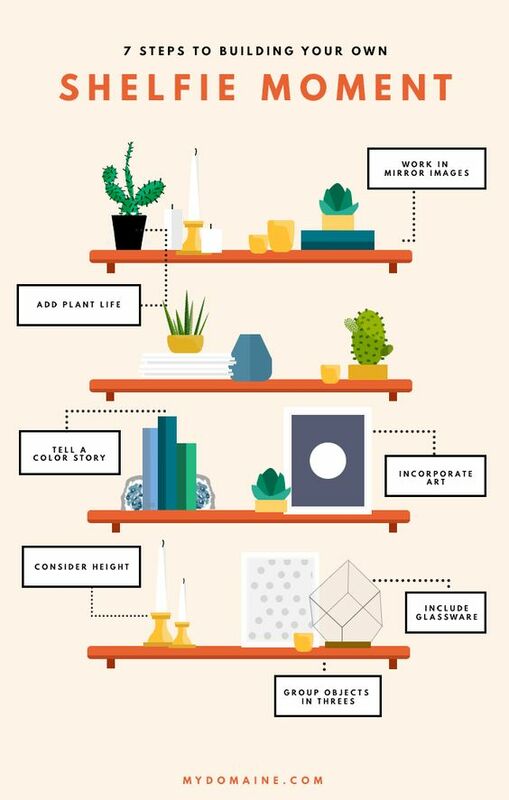 I’d love to know what you’re reading or decorating your shelves!